How can we rethink heritage? How can the conservation, promotion and transmission of heritage be adapted to the challenges of the future? Urbanisation, climate change, global inequality, big data – much work lies before us. The most important actor in this debate is our global youth, the ones who will drive the change that is only starting now. 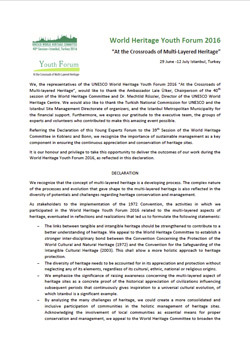 This is why the UNESCO World Heritage Centre organizes not only the annual Session of the World Heritage Committee, but also a World Heritage Youth Forum, which is an integral part of the event. The 28 participants, united by a conviction that young voices matter in shaping a better future for our heritage, presented the results of their work in the form of a Declaration at the Opening Ceremony of the 40th Session of the formal World Heritage Committee. In their declaration, they committed themselves to leading the way for the change we need by mobilizing youth all over the world and by transmitting their expertise to future generations. Everybody should be able to appreciate heritage in the modern era. But we have to learn how to manage heritage in a new way. This is why the participants assisted in the first plenary day, 11 July 2016, which provided an occasion for the young representatives to exchange fresh ideas with the delegates, an occasion for the whole heritage community to come together. A short video (5 minutes) showing how the young delegates immersed themselves in a variety of activities linked to their theme “At the Crossroads of Multi-Layered Heritage” was also presented. They included visits to World Heritage sites, including Bursa and Cumalıkızık, guided by international heritage experts; workshops on different challenges emerging from multi-layered heritage management; practical hands-on activities with timber and stone for the protection and maintenance of the World Heritage site in Istanbul; experts’ and young representatives’ presentations; and discussions on the state of conservation of properties within the framework of a Youth Model simulation. The World Heritage Centre would like to congratulate all participants on their excellent work. Now it is time for their discussions to inform our discussions.